Colour and signal normalisation of digital images is an indispensable task which must be done prior to any analysis stage in medical, industrial, engineering, or cultural heritage applications. Due to non-homogeneous registering conditions on site, the registered signals and colours cannot be compared across the photographs that form the whole dataset. The irregular illumination pattern projected on the object being photographed is the main factor that causes that the signal/colour registered in different areas or images are not comparable. Normalisation of registered signals in different images is a crucial step that allow users to obtain good results to posterior data analysis. In particular, colour appearance is of paramount importance in cultural heritage recording, intervention and dissemination. GIFLE is currently developing relative colour normalisation models for correcting or homogenising colour through image-based 3D modelling. Sensor noise performance is responsible for some kind of uncertainty in digital images. An accurate and meaningful procedure to model the image sensor noise is useful for optimising sensor design as well as for knowing how much sensor uncertainty is present in an image due to different sources. A multilevel random-effects model with multiple factors and grouping is a suitable model for approaching the image sensing and its different components. The model was formulated by means of Bayesian hierarchical modelling and fitted using MCMC methods. The presented approach achieved a useful interpretation and an accurate estimation of the image sensing parameters, showing how intuitive and flexible the Bayesian modelling framework can be in order to model and monitor the image sensing parameters. 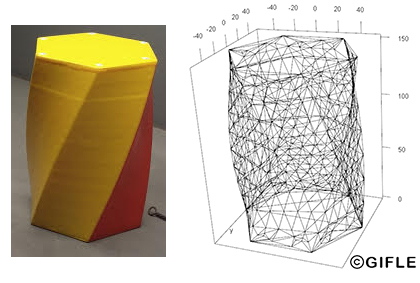 For the analysis stage of the photogrammetric processing, our research group is developing new Bayesian models for pattern recognition and classification. Bayesian inference can be considered in a certain way as a novel approach scarcely implemented on image data. Our aim is to explore and provide new efficient statistical models, able to enhance the power of multispectral information available in imagery. Archaeological documentation, where colour plays a fundamental role, is an arduous and demanding task, because of the difficulty of measuring the pigment, the complexity of the support and the variations in the cave lighting. The correct determination of colour provides vital information at a descriptive, technical and quantitative level, which allows a better understanding of the study area and offers, among other attributes, information regarding the origin and ageing of the pigments, for instance, in rock art. The colourimetric accuracy of the data captured through digital cameras requires the characterization of the device, since the sensors use colour spaces different to the CIE physical basis spaces. Once characterized, a conventional digital camera could be used for rigorous colour determination in a physical basis colour space, independent of the device and comparable with data from other cameras that are also characterized. The aim is to provide a solution that will help us integrate the spectrophotometric and colourimetric analysis as a complement to photogrammetric and multispectral techniques that allow an improvement in the automation for the identification and representation of pigments with maximum reliability in surveys, 3D models and reconstructions. Metric documentation of cultural heritage at different scales requires the efficient integration of geomatics techniques. It is more required to document better and accurately our architectural and archaeological heritage in order to improve knowledge, conservation and pass on to future generations in the best conditions. GIFLE relies on high-end photogrammetric solutions based on digital cameras, laser scanning, multispectral sensors, as well as the in the integration of GNSS/IMU data. The resolution and precision of the work either 3D models, photorealistic 3D models, rectifications, orthoimages, scaled plans, sections or drawings will depend on the requirements of the conservation and/or restoration project.. Many applications require perfect virtual replicas of an object, artwork, architectural monument o archaeological site as they were when the data was taken on site. High end photorealistic 3D models require, in addition to appropriate planning and data acquisition, careful processing and efficient management, as well as perfectly calibrated cameras, laser scanning and sensors such as panchromatic, colour, multispectral and thermal cameras. GIFLE makes use of high-end procedures that seek to automate most of the tasks of spatial measuring, without the need for physical contact by means of multisensorial photographic images and/or three-dimensional whiskbroom laser scanning technology. The advantages associated with the techniques of close range photogrammetry are many, stressing the accuracy that is achieved in the generation of digital surface models, reducing processing times, as well as the ability of texturing the photographic images onto the digital models in 2D, for generating 2D digital orthophotos or orthoimages, and in 3D, for generating photorealistic movies and animations. Heritage is affected by the weather, causing aging, alteration and degradation of the materials and consequently their aesthetic appearance. The definition, inventory and mapping of material and physical damage is essential in planning the different stages to be carried out in conservation and restoration works. Our research group works in the analysis of visible, IR and / or thermal images, these techniques allows us classify the materials and identify deteriorated areas, dampness, water filtrations and heat losses, etc. Analyzing the materials and pathologies in a non-intrusive way with these techniques we can preserve in this way their conservation state. Augmented Reality (AR) overlaps, in real time, all kinds of virtual contents to the reality that we perceive through the camera of a device. AR can be applied to many different areas such as: education (interactive books, multimedia spaces, edutainment, etc. ), medicine (prosthetic placement, guided operations, training, etc. ), engineering (planning on site, guidance of machinery and personnel, etc. ), industry (manufacturing, assemblies, simulations, etc. ), tourism Virtual interactive, etc. ), cultural heritage (reconstruction of monuments destroyed in situ), architecture (urban planning, restoration, etc. ), art (interactive installations) and entertainment (video games in real time). Virtual Reality (VR) immerses the user in virtual environments created by computer. This visualization technique allows to display virtual reconstructions of any place obtaining an immersive 3D visualization. With the emergence of new 3D glasses (such as Oculus Rift), applications of this type have increased greatly, especially in the field of video games. 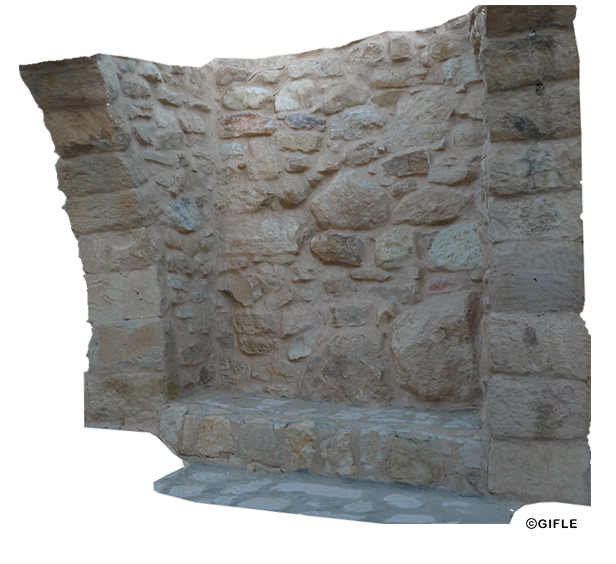 In Gifle, from the photorealistic 3D models obtained by photogrammetric techniques, we create virtual immersive environments for heritage disclosure, video games, simulation, etc. DEVELOPMENT OF A LOW-COST AND LOW-INVASIVE PHOTOGRAMMETRIC SOLUTION FOR THE ANALYSIS OF CRANIAL DEFORMATION IN INFANTS. Cranial deformation is one of the most common problems attended in paediatric neurosurgery units. 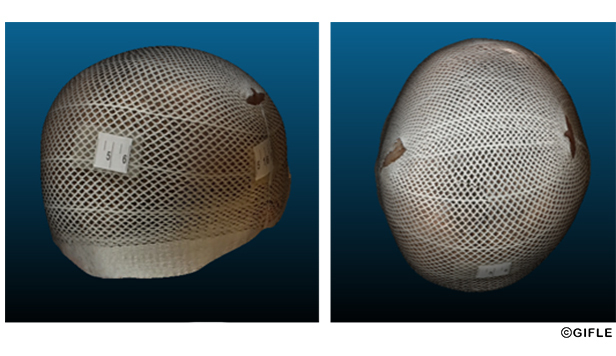 Although most cases are benign, some require the use of prosthetic helmets or even surgery to be corrected. Most evaluation methods currently in use are strongly limited, while others have important disadvantages such as high costs or the use of radiation. We are developing a photogrammetric solution to obtain cranial models using smartphone images taken during medical consultation. 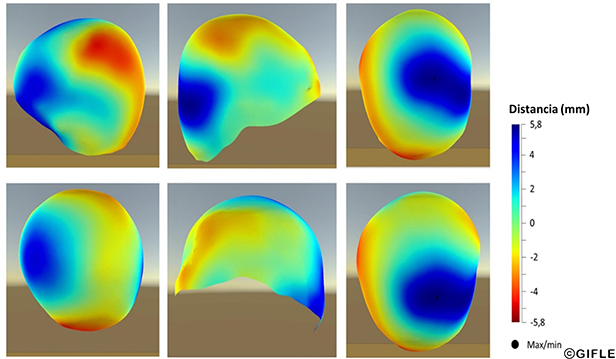 These models will be automatically evaluated to obtain the cranial deformation parameters. The solution will also allow the comparison of models taken at different dates to evaluate the evolution of the patient. Department of Cartographic Engineering, Geodesy and Photogrammetry. © GIFLE, 2014. Universitat Politècnica de València|Dpto. Ing. Cartográfica, Geodesia y Fotogrametría. Design: HTML5 UP.